Youth's Elastic sided Pony Club riding boot. One piece leather upper children's Pony Club riding Boot. This boot is fully leather lined with a full foam padded leather foot bed, Has a smooth patterned sole for riding safety, and good ankle support. The collar is higher than normal so the jodhpurs fit down over the boot without bulging making the the rider look and feel better. It is made on Australian fitting Last so fit is guaranteed. 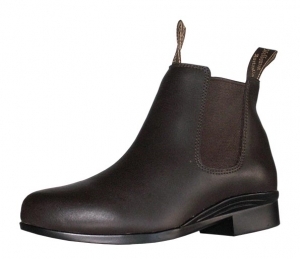 The heel stiffener is designed to give maximum support for the life of the boot.